It seemed a bit unfair to have a freeze watch in effect 10 days after our frost-free date. 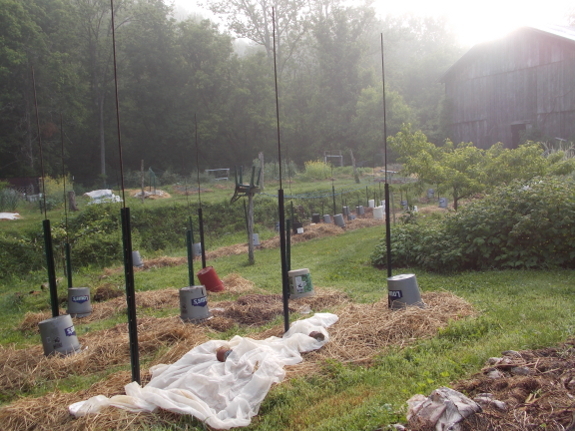 I'd set out everything frost-sensitive except our peppers, so it took about an hour Friday to put buckets over each tomato plant and row covers over the strawberries and vegetable seedlings. I had to leave about half the tender vegetables uncovered, though, because I ran out of fabric (and gumption), and, of course, the hardy kiwis and fruit trees are always at risk. Luckily, the low only dropped to 34, and we didn't even see frost in the cold air drainage path (back garden and gully) that usually seems to get hit first. I did hear a round of dripping off our metal roof and into the gutters just as the sun hit this morning, though, suggesting that we saw a light frost on that conductive surface. 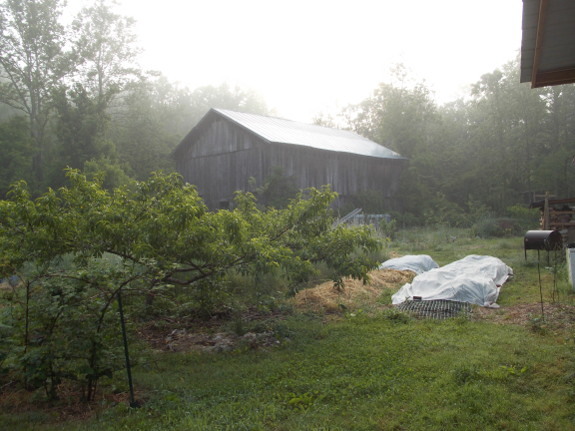 Our local weather guru says there's a good chance that our area has set itself up in a feedback loop of cool, wet conditions that may last all summer, and the slowness of the garden this year does seem to support his hypothesis. I can't quite figure out what I should change in that case, although I know it means we're likely to lose our tomatoes to blight quickly and our peachs to brown rot. Perhaps I should seed a few flats of summer broccoli and brussels sprouts as a consolation prize? Or start doing sun dances? Our chicken waterer keeps the flock happy with clean water rain or shine. I feel bad about your weather forecast. But then i remembered what my friend at work did to have huge tomatoes in 2012. Have you guys thought about helping to heat your soil for you tomatoes and peppers by covering it with black plastic. I personally don't like plastic for anything. But with your weather situation do you think it could help? Also I wanted to ask you, would you mind telling us what stuff you like to apply to your vegetables to help them along. For me this year I am using compost tea and worm tea. And I haven't heard anymore about your deer deterrents did you guys get that situation perfected. I don't have deer problems but my friends at work do. Thanks again for your posts, please keep writing, I love your garden posts. John --- I'm very anti-black plastic, even though it can provide some short-term help. It blocks air to the microorganisms in the soil, and also blocks rain so you have to irrigate. And then, after a year or two, it shreds and you have to throw it away. We don't apply much to our vegetables. I lay down a half inch to an inch of composted horse manure, plant into it, then mulch with straw, and that's pretty much it. I pick bugs and pull out troubled plants (or leaves), but we don't spray anything. No news on the deer deterrents because it's been about a year now since Mark finished fencing in our homestead. Our chicken moats have done an awesome job at keeping the deer at bay, and we haven't seen a single nibble in over a year! A huge relief.... The deer deterrents were a pretty effective, low-cost way to get the same job done before we had the time and money for a fence, though, so you might recommend it to your friends.